House finch on a glass creamer I repurposed as a bird feeder. It once belonged to my grandmother but isn’t worth much because it’s chipped. She loved birds, so I know she’d approve. My pastimes of thrifting and birding inspired me to create bird feeders from repurposed items. It began a few months ago when I was given a commercial feeder to trial. Its peaked roof is “cute” (to quote a friend), but it’s made of plastic (shudder) and is a color I call “hose green”—a blue-green not found in nature. It also was too efficient. House finches (linnets) emptied it quickly, and one cup of seed mix is all I wanted to give them daily. Plus, watching these mice of the bird world stuff themselves became boring. All they did was sit, eat, and lunge at rivals who wanted to share the feeder. I read up on wild birds—their habits, what species frequent the foothills of inland Southern CA, and what they eat. I also researched the ideal bird feeding experience for both birds and humans. Feeders should be located where you can watch easily from indoors, birds can dart into nearby branches, and well above the ground so cats can’t pounce and it’s difficult for rodents to help themselves. So with bird-feeding in mind, I trolled estate sales and thrift shops. I decided to go with inexpensive objects I found in abundance: wrought iron candleholders with metal rings for votives in glass cups. It seemed that such shallow vessels (sans candles) would hold the right amount of bird seed, and metal rods in pleasing ornamental shapes would make good perches. Although I planned to do only one feeding station at first, I went on to create three on the deck outside my kitchen and dining room. Much thought, creativity and fun went into modifying these three stations to maximize their appeal to me and to my feathered guests. 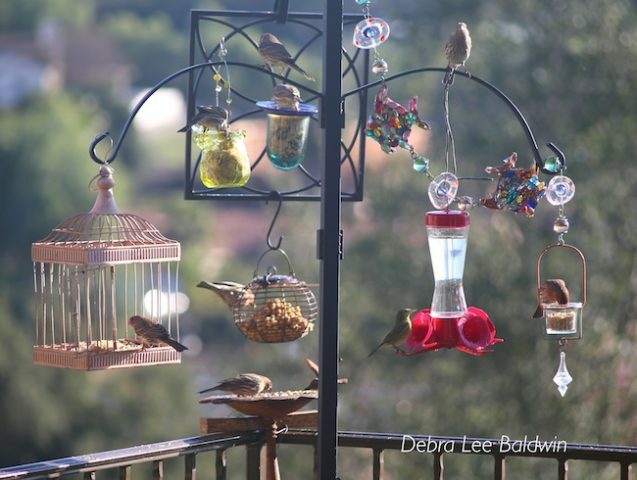 Bird feeders on a plant stand create a feeding station. Wire ball at center contains suet. Birds are house finches and, at the hummingbird feeder, an orange-crown warbler (also shown below). I discovered that house finches will feed vertically if need be—beaks straight down and tail feathers skyward. This made me wonder what other antics and acrobatics these highly common little birds might do. Although I stopped short of adding a maze, I decided the ideal feeder needs an entertainment factor. Also on the plant stand I hung an old wire birdcage. It’s still my favorite feeder. I love watching wild birds eagerly enter the cage, the door of which I’ve wired open to avoid accidentally trapping one. (I’ve also spread the wires a bit on the opposite side, so they have a second exit. They enter the cage that way, too.) A plump mourning dove, seduced by the scent of peanuts, also cages itself from time to time. House finches come and go like adolescents with cars. They arrive all at once, boisterous and noisy; pushing, flapping, and ravenous; each with a wary eye out for the Lady of the House. When she appears, they take off with a whoosh, offering no thanks, apologies, or stacking of dishes. 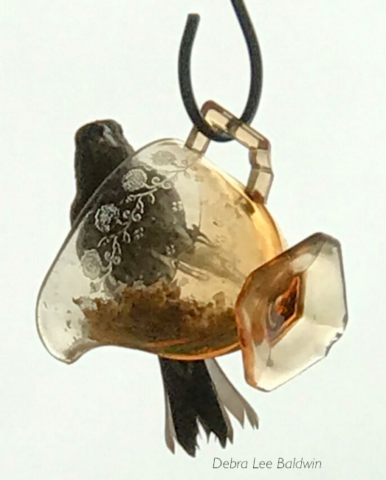 In my tea party themed station, glass feeders make the birds easier to see. I nailed two matching S-shaped candleholders horizontally beneath the eaves, then wired chains to them, and added hooks to hang tea cups, a sugar bowl and creamer, a tea pot, and a serving tray with a handle. The initial version used floral china cups, but I soon switched to glass. Glass is like solid air, so it suits an airy feeder, plus you can see the birds better as well as how much seed is left. I still need a transparent tea pot. Which is to say, I really need to go thrifting. Soon. — Be patient. It may take birds several days, even weeks, to find a feeder. — If you leave food sitting out, even if it’s not in a feeder, house finches will find it. Although wild birds are endearing when hopping on patio furniture, they do make a mess. — Visit your local Wild Birds Unlimited store. The employees are friendly, knowledgable and happy to share information. Pick up a bag of WBU’s “No Mess Seed Blend” of nuts and seeds already shelled. — Expect a bonanza of birds on a rainy day, which also is a great time to install a new feeding station. — Hang breakable objects so they won’t hit each other if jolted by wings or wind. — At dusk, bring indoors food that might attract nocturnal varmints like rats and opossums. — In winter, add suet (from a bird store or garden center) to your feeding station. — Don’t add food coloring to hummingbird syrup. The red of the feeder is enough to attract them and the dye may even harm them. 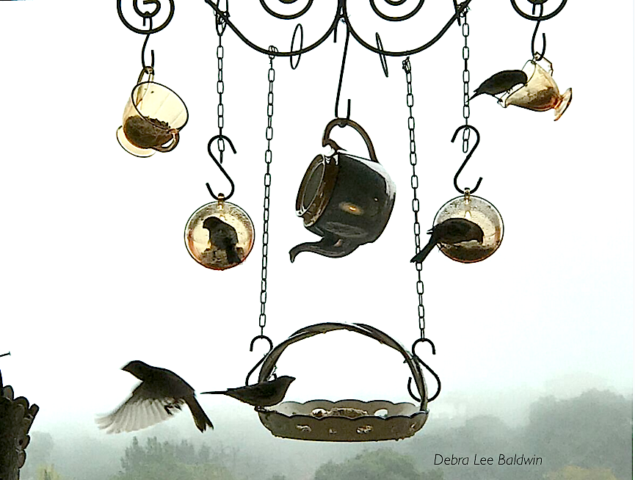 — Keep hummingbird feeders clean; mildew and fungus can make birds sick. — When placing a feeder, don’t forget that whatever is below it will be showered with bird droppings and seed husks. — Hardware stores sell black S-hooks in the garden department; regular S-hooks (which are cheaper but silver colored) in the hardware section. You’ll also need chain (sold by the foot), flexible wire, and a wire cutter. — Turn off the lights in the room in which you’re observing wild birds, so it’s harder for them to see you. Regardless, avoid making sudden movements. — Get a good pair of binoculars (mine are Polaris Optics). They’re a portal to another world, both at feeders and beyond.